Citizens Bank Minnesota offers free ATM or Debit cards to all its customers with a current checking account and approved credit. Deposits can be made into checking or savings accounts at ATM machines that accept deposits in Minnesota. Customers may check account balances and transfer funds between checking and savings accounts at all ATM machines. When making a purchase, you may select either Debit or Credit. By selecting Credit, you will be required to sign for the purchase. By selecting Debit, you will be required to use your pin number, which may give you the option to request cash back. Debit Card Pin numbers can be changed by calling 1-866-985-2273. For security purposes, daily dollar limits are set on all debit cards, but can be adjusted upon request to accommodate for larger purchases. If you are planning to travel with your debit card, be sure to notify Citizens of dates and location. We will update our system to help prevent transaction denial in blocked areas. Be aware that there is still a possibility that specific transactions will be denied if requested at a high risk area or vendor. It is advised that when traveling customers bring more than one source of payment. If a Debit Card transaction is denied, an option would be to contact the bank to research and assist, or locate a nearby ATM to withdraw cash. All ATM and Debit cards are monitored 24/7 by our card fraud service. Card holders are notified with a phone call to verify transactions that seem unusual and cards may be put on a hold status until verification is complete. If your Instant Cash Check Card has been lost or stolen and you cannot contact a person at (507) 354-3165, please dial (800) 535-8440 for an immediate response from Instant Cash. 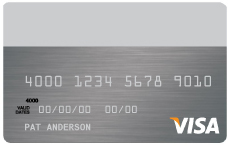 So, what is that 3 digit code on the back of your credit card? Why do we need it? This 3 digit code is called a Card Verification Value (CVV) or CVV2 code. It provides extra security to you as a card holder. This code, along with your address and zip code, is used to prevent fraud. It lets the merchants know that you are physically holding the card in your hand when you make a purchase online or over the phone. When donating or shopping online, your CVV2 code is sent electronically to the card-issuing bank for verification and authentication. For security purposes, merchants are prohibited from storing this number. It is important to understand this security feature and do your best to keep it private. You can read more at What Is a Credit Card CVV? | eHow.com.